The New Hampshire River Map shows the major waterways of the New Hampshire. The state has about 1,300 lakes and ponds, most of which drain to the Merrimack or Connecticut rivers. The state's main rivers include Salmon Falls, Merrimack, Saco, Connecticut, Androscoggin, Souhegan, Pemigewasset, Ashuolot and Piscataqua. Winnisquan Lake, Sunape Lake, Moore Reservoir, Winnipesaukee Lake, First Connecticut Lake and Second Connecticut Lake, which are prominently marked on the map. Since the state of New Hampshire falls under the watershed of Atlantic Ocean, the river map also highlights the ocean. 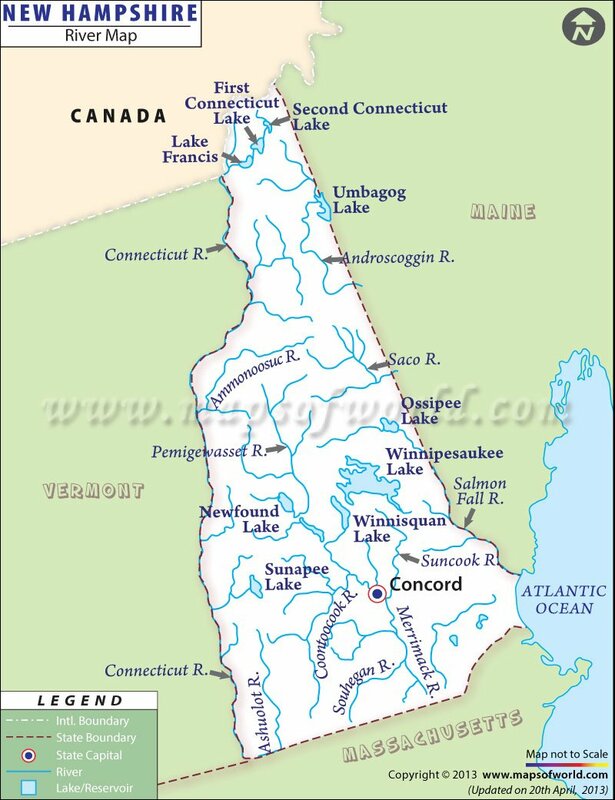 Concord, the state's capital, as well as the cities located on the banks of major natural streams of the state, are indicated in the River Map of New Hampshire. The New Hampshire State Map also offers important information regarding New Hampshire's lakes, streams and ponds. The various rivers flowing in the state contribute significantly toward the agricultural industry of the place. The New Hampshire River Map offers a complete overview of the drainage system of the state.